Lindsay Gasik has been living in Malaysia and travelling around the region for about six years, but she still gets curious looks from locals wherever she goes – and it’s not because she’s Caucasian. It’s because she’s a durian expert who conducts tours in Malaysia and around Southeast Asia for those who love the fruit and want to devour the different varieties. “People always think I’m just a tourist and they want to know when I’m going home, but I don’t feel I have a home,” says the 29-year-old. Since she arrived in Asia in 2012, Gasik has been living out of her backpack, going from one country to the next on her durian trail. Her blog, yearofthedurian.com/blog, has a wealth of information about the fruit with tantalising photos to boot! It all started in 2009 at a vegan food fair in her hometown of Central Point in Oregon, United States. “I transitioned to a vegan diet in 2007 but I was experiencing some health issues, and it so happened there was a vegan festival in my hometown and I decided to check it out. “When I got there, there was this weird smell wafting through the festival grounds. I didn’t think it was bad but it wasn’t something I’d tried before. I couldn’t figure out what it was,” she shares. And so began Gasik’s hunt for durian. She found frozen durians at a Chinese grocery store and she fell in love with the creamy, rich flavour of the fruit. “I had never tasted anything like it. It was so different, and I needed to understand it,” she says. Oregon was facing a recession at the time and Gasik, who’d just graduated from university, couldn’t find a job. Her father suggested that she travel for a year until the economic situation got better. “I wasn’t interested in the usual tourist attractions, but when my father suggested I travel I decided to track down this fruit,” she says. That brought her to Indonesia, and then other countries in Asia where she has been for the most part since. “I found out through online research that durians were in season in Sumatra, so I booked a ticket to the biggest city and just asked a lot of questions and found my way to some farms. It was a lot of luck actually, but I had to overcome my shyness and start talking to people,” she shares. Gasik charted her travels and experiences with durian on her blog, which was meant to be a journal for her family and friends to know what she was up to. What she didn’t expect was for her blog to gain traction among durian lovers. “One day I looked at the analytics for my blog and realised I got about 1,000 views daily. I was getting emails from people asking me questions about where I was going next and asking me if they could go with me. Gasik’s blog is now a well-known resource for durian fans keen on hunting down the best fruits and trying the varieties that are specific to different countries. She has extensive knowledge about the “king of fruits”, which she has gained from conversations with farmers, horticulturalists and durian fans. “My purpose is to help people find their best durian. If you tell me you want a durian that’s sweet and dry, I will find it for you. I think of myself as sort of a durian sommelier,” she says. 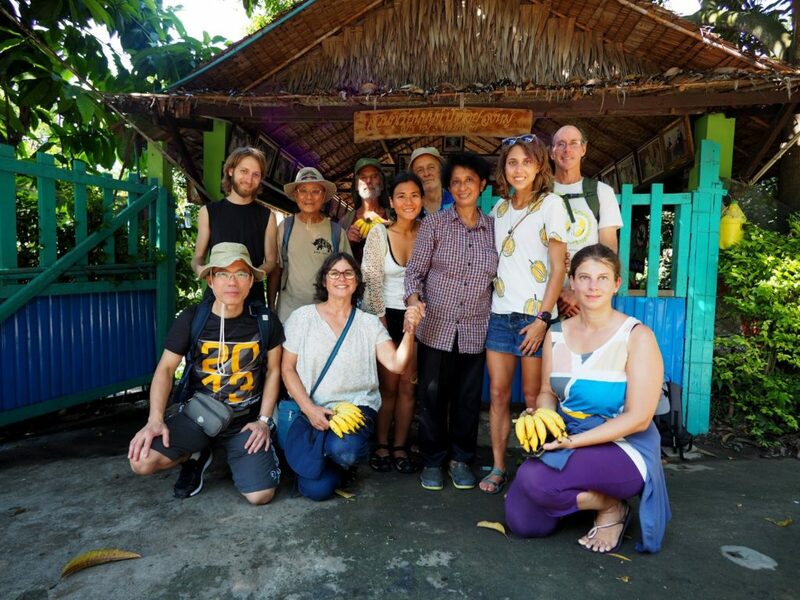 Apart from her durian tours, Gasik also writes about durian and her travels for magazines and online sites, and gives presentations about durians too – how to choose a fruit, how to open one and where to find a durian to suit a person’s taste preference. “I get tired of eating it sometimes, but I love learning about the fruit and the people. It’s about meeting and learning from people, particularly farmers. Comparing the fruit in every country, learning about the people and how they experience flavours – that’s what’s really interesting. “It was never just about tasting the fruit but a way of exploring a bigger topic,” she explains. In early 2018, Gasik wrote a book, The Durian Tourist’s Guide To Penang, which focuses on the varieties of durian in Penang, featuring 65 farms in the state and a pictorial identification of about 25 varieties. “I’m currently working on another book – telling the stories of all the durians in Malaysia. I’m also trying to work with local guides to see how I can combine nature and cultural tours with a durian tour,” she says. Gasik’s tours are gaining traction among tourists from all over the world, which keeps her busy throughout the year. “There are a lot more people into exploring places in a different way, and that’s really cool,” she says.